9,000 PAYMENT CENTERS NATIONWIDE: SUBICWATER customers now have access to ECPay-accredited establishments after a memorandum of agreement was signed between the two firms on September 3 in Quezon City. In photo are (L-R front row) ECPay General Manager Ma. Patricia Dela Fuente- Pascual, ECPay President Jude Aguilar, SUBICWATER CEO Benjamin Antonio III, and SUBICWATER Head of Finance Lhen Baluyot; (L-R back row) SUBICWATER’s Head of Treasury Jamaica Pascual, Head of Corporate Management Services Rolando Decena, Comptroller Specialist Raymark Bingcang, and ECPay’s Account Executive Marnelyn Malabanan. 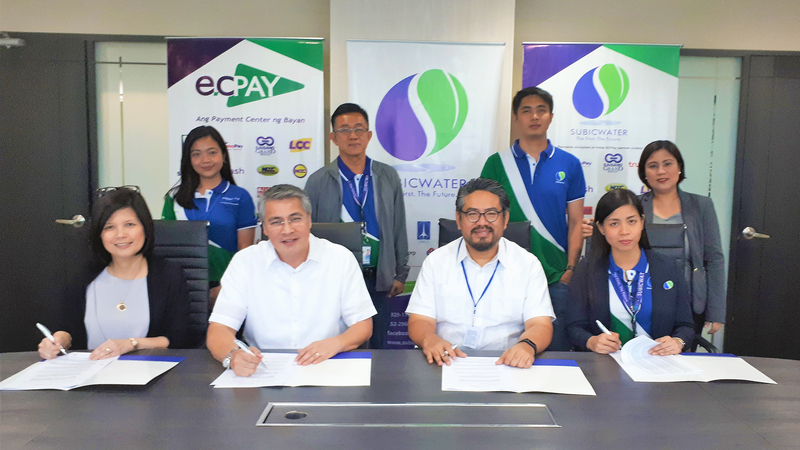 Subic Water and Sewerage Co., Inc. (SUBICWATER), the exclusive water utility provider of Olongapo City and Subic Bay Freeport, has partnered with Electronic Commerce Payments Inc. (ECPay) to make the latter’s 9,000 payment outlets nationwide available to SUBICWATER customers. “ECPay is a welcome addition to our growing list of accredited payment centers. They carry 7-Eleven, San Miguel Food Avenue, Petron Treats, plus a lot more banks, pawnshops, remittance centers, and various merchant outlets,” said SUBICWATER CEO Benjamin Antonio III during the signing of a memorandum of agreement with ECPay officials on September 3. Antonio also took pride of ECPay bringing in mobile money service G-Cash to SUBICWATER customers, saying that cashless transactions will soon be the norm in the near future. “For those who will try out G-Cash for the first time, please take note that the check digit at the bottom of your water bill will be used for the transaction, instead of the SUBICWATER account number,” he reminded SUBICWATER customers. SUBICWATER also offers other payment methods to its customers including online payment, accredited payment centers and partner banks. For a list of accredited SUBICWATER payment centers, visit http://www.subicwater.com.ph/payment-centers/. “Our website also has a ‘partner outlet finder’ which you can use to locate ECPay-accredited establishments in a given area,” he said.